Dr. Jebaroja Singh isn’t just a professor for classes like World Cultures and Global Gender Studies, she also practices what she teaches, as an ethnographer. 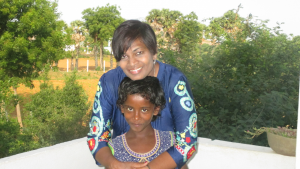 When she isn’t here at Fisher, Singh travels to Tamil Nadu, India. 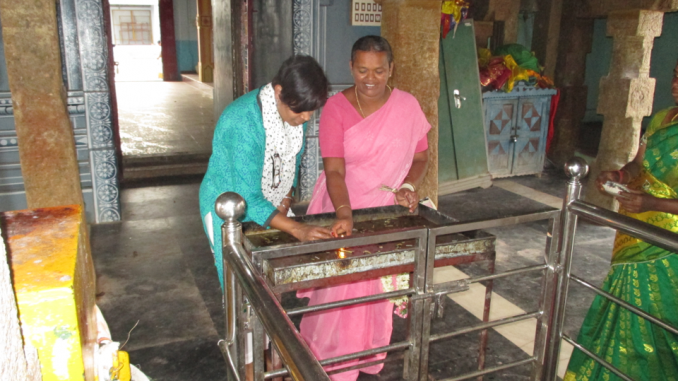 While there she has been able to make important observations about Southern India’s modern caste system and interact with Dalit woman advocating for social change. The Anthropology Club on campus recently invited Singh to discuss her ethnographic book and the process it took to conduct the research, write a manuscript and finally get published. Her book, Spotted Goddesses: Dalit Women’s Agency-Narratives on Caste and Gender Violence (Contributions to Transnational Feminism) was published in October. Singh used a method called participant observation, in which an anthropologist enters and engages with a community while gathering data. Singh started her visits in 1990; her book was a culmination of a three-decade process to build rapport within this Dalit community. Two friendships she developed with Kalaimagal (Kalai) Arumugan and Rani Periasamy were the inspiration and basis for her writing. Kalai is the founder and director of Dr. Ambedkar Women and Children Regeneration and Development Program, known as Dr. AWARD. Through interactions with Kalai and her co-worker Rani, Singh was able to gather oral narratives about the life experience of the women in the Dalit communities where they were working. While hearing about caste-based discrimination and inequalities was difficult for Singh it was also a topic she feels is important. Singh expressed that it’s imperative to change dominant narratives that maintain the current caste hierarchy. One method of activism employed is taking a “stigmatized identity and subverting it to one’s own advantage,” for example embracing being different and not accepting the “place” that the historical system has assigned. One of the ways to change the narrative that has existed in India for so long is empowerment through educational opportunities. In a collaboration between the U.S. and India, Singh with Kalai and generous donations, began a program called “Thai,” which in Tamil means “mother.” This program focuses on education and creating a safe space for young girls. They conduct sustainable organic farming and board the girls during the school week providing nutrition and meeting their needs. Termed by Singh as an intervention, this gives the girls private tutoring, self-confidence and skills. The great benefit is that it is allowing Dalit females opportunities beyond the boundaries of their caste. Rather than use the term feminism Singh has coined the term, “earthy humanness” to embody the passion, energy and courage it takes to speak up and be “a rebel who transgresses the set social boundaries” of one’s culture. The greatest take away, she said, is for students to understand that people possess agency, if someone has been unheard, they can be heard — we just need to listen.